So you want to build a dog training obstacle course like the one you saw on your favorite dog show, but you don’t want to break the bank. The good news is you don’t have to! You can build some simple agility tools for very little money and time. Many of the items you can get at hardware stores such as Home Depot or Lowes or maybe even your local store. 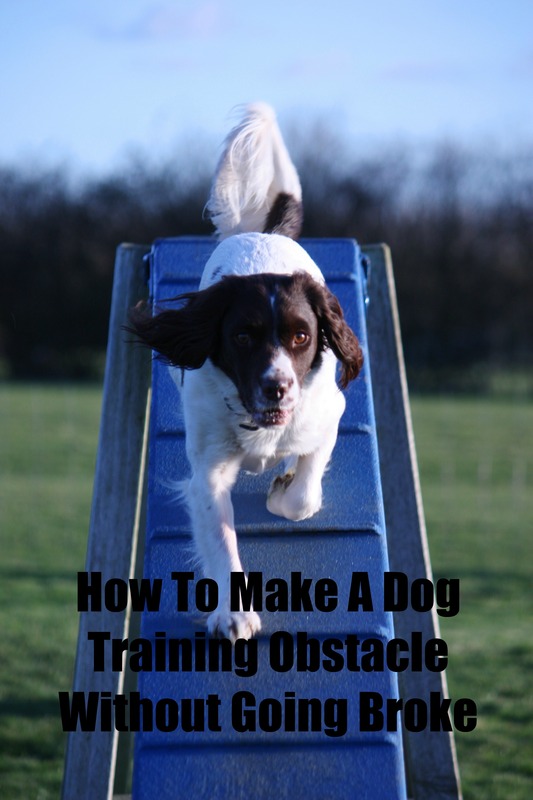 Check out below how to build a dog training obstacle course for cheap! Jumps: This is one of the key parts of a dog training obstacle course. When building a jump you want to make sure it is collapsible, as you don’t want your dog to jump into something solid and get injured. You are working on his agility not seeing how many vet visits you can handle in a month! The good news is you can create jumps from items you can get at your local hardware store. All you really need is PVC pipe and cups (the C looking things that hold pipe). Make sure you are able to move the cups up and down so you can adjust the height once you figure out how high your dog can jump. Weave Poles: The most inexpensive way to do this is with orange traffic cones. They are easy to pick up and store and you can change up the pattern as you wish! These tend to be bigger than what is used in agility training, but they work well if you are just starting or are casually training your dog for fun. Tunnels: A child’s play tunnel is perfect for this! It’s also much easier than trying to make one from scratch. You might already have one and if not, check out the yard sale sites on Facebook for one used and close by. You want to make sure it’s sturdy enough that it won’t collapse on him (how traumatizing! He won’t ever go through that again if that happens!) but also flexible enough that when he runs into the sides of it, it goes with him. This one can be scary as it is enclosed, so make it the best experience possible. You can get on the ground alongside it and coach him through, or if you dare, get in it yourself and coach him along! Lots of positive reinforcement. Ladders: You can create this with 2 pieces of plywood and a few pieces of smaller wood (smaller than a 2×4) for the steps. Just make sure there are no chances of splinters you don’t want to pull them out of Fido’s paws! Also, make sure when you attach the 2 pieces of plywood together you have it at a decent angle for your dog, not to high but not too shallow either. As you can see, it doesn’t take much to money to build your own backyard dog training obstacle course. You will have such a great time training him to go through the tunnel and dodge the cones, you might think you are ready to have him perform on television! One step at a time. Have you ever built a dog training obstacle course? What sort of things did you use? Share with us below!